Why Ergonomic becomes a stylish and popular trend for furniture? Ergonomic furniture is a new trend that aims to design comfortable and safe items. If you spend more hours at work you need to have comfortable furniture, not to feel stressed or suffer from neck pains, backaches or headache. 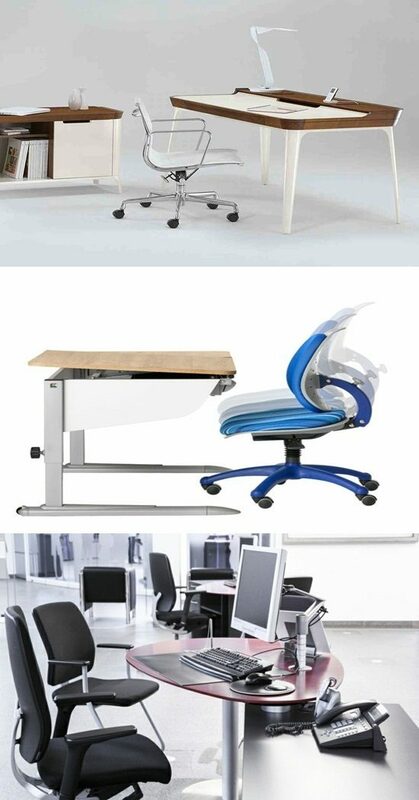 Therefore designers invent this healthy Ergonomic furniture to make your work office atmosphere comfortable and energetic. How could you know you get the best ergonomic furniture? Ergonomic Chairs: the chair height has to be adjustable. The seat height should be adjustable from 24 to 16 inches from the ground. That makes the worker feel so comfortable when doing the work and to avoid the stress on the leg especially the knee. The seat width and depth should be comfortably enough for the user. The backward and forward tilt of the seat should be adjustable for granting the user of enough relaxation. The lumbar support should also be adjustable and it is important to comfort your back. So the lumbar adjustable curve may ensure the maximum amount of comfort for each user. The chair armrests should be also adjustable and allow the user to set his arm comfortably and his shoulder to be relaxed. The chair material should be comfortable and have enough padding to enable the user to sit on for a long time relaxed. The Ergonomic desk: there are various kind of this disk like stand and sit desk which has a benefit of adjustable height and it is so useful for some user in certain position to enable them do their work standing or sitting. The other kind is portable disk which is not only adjustable but also it can be moved easily. The ergonomic furniture is the best investment and stylish furniture to decorate your office. It increases the productivity of your work because you will provide your office workers with comfortable furniture which enable them to work with less stress on their body.